Well today is the big day...we took Andrew's pacifier away this morning. I have been building up for this moment for awhile now. I really wanted the paci gone by the time baby #2 comes...so Matt and I just decided today was the day!!! This morning we gathered up all of Andrew's paci's and had him throw them away in the garbage (along with our paci holder). Then we wrapped up the garbage and had him throw it away in the outside garbage. He wined about it for a minute but we kept telling him he was a big boy and did not need the paci anymore. Matt had the morning off so we went out this morning. Andrew asked for his paci in the car a few times but we kept reminding him he was a big boy and the paci went bye-bye. We took him to Target and bought him a special stuffed animal to put in his bed with him (this was my sister's idea and it has been great), sort of in place of the paci (he picked out a stuffed Elmo of course). Nap time has been the hardest, but he did well considering he has had his paci at bedtime since he was born. We let him cry for about 10 minutes. I went in to console him, rub his back and he went to sleep. The whole procedure took only 20 minutes. I am pretty happy with how this has gone SO FAR...we still have bedtime to tackle and our first night without a paci, but Andrew is doing well. I think it helps that I worked myself up for the ultimate worst!!! 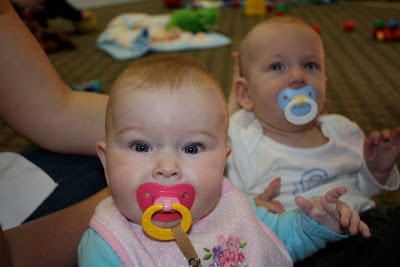 Andrew and his buddy since birth, Ruby Jane and their pacifiers. Andrew and his other buddy, Ben and their pacifiers.